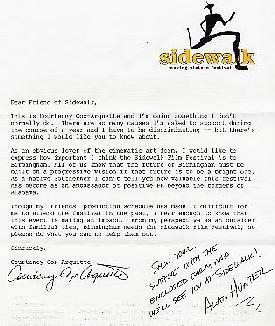 Birmingham() The text of a Sidewalk Moving Picture Festival promotional letter received by the 'Hamster was so perfectly crafted that all attempts at further parody have failed us. We must apologize dear reader that we cannot find a way to make the letter more ridiculous or over-the-top than it already is. The only explanation we have for our inability to satirize this letter is that its blatant use of "star power" cannot be real. The letter, seemingly a personal invitation from Courteney Cox-Arquette, was so clever in its non-intentional humor, that it must have been sent to us "pre-parodied." We believe that it could only be the work of toastmaster Alan Hunter himself, as its utter ridiculousness cannot be topped. Leave it to the brilliant Mr. Hunter to come up with such a subversive promotional technique, thus equalizing the great equalizer. We are humbled, and yet we move on. Apologies also to Mrs. Cox-Arquette for our initial belief that this difficult prose was her own. 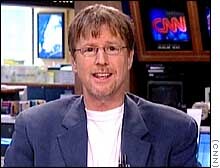 Birmingham() In a heartfelt moment amidst the barrage of media hype surrounding this weekend's Sidewalk Moving Picture Festival, former MTV VJ Alan Hunter admitted to a CNN audience that most of the time he can't even stand his own self. This startling revelation came after one of Hunter's trademark rambling speeches in which he ridiculed festival founder Eric Jambor for the umpteenth time. "This festival is even more demanding than his wife," said Hunter while simulating a cracking whip. "And he does it all for free." Hunter proceeded to imply lack of sophistication on the part of 'Hamster audiences for not being more receptive to locally produced independent film, possibly including Hunter Film's own 'Pornacapella' (no relation to the group 'Rockapella' that plays frequently at WorkPlay, Hunter's Birmingham digs). "I guess I'm just upset that I was never able to turn that MTV gig into something bigger. I hate myself for it, and probably most of you too." B'hams Historic Theater & Hot Dog District(JM) Attendees at a recent Sidewalk film screening really wanted to appreciate the artistic effort of young visionary director David M. Smith but were left confused and vaguely disturbed by his stark futuristic tone-poem, 'Avalon Beach'. The story, concerning two artificial legs from different times, went mostly over the heads of festival-goers. In the film -- shot on location in San Francisco, Panama City, and Ensley -- a young man, sent to retrieve an expensive robotic cyber-prosthesis in the bowels of a decaying factory finds that it has gotten tangled up with a much older, simple wooden peg-leg. He is instantly enamored of the half-rotten appendage and takes it into his constant possession, much to the chagrin of his companions who steal it from him and throw it into an endless sea as the credits roll. "I dont know," said audience member Randy Halprin, "I guess it was pretty cool with the giant Easter Island head and the whacked out Honda of the future. I just didnt get who these people were, you know?" Allyson Fitzpatrick, who had been warned that the story was enigmatic, was more supportive, "I think he [Smith] did a wonderful job of capturing the mood of summer afternoons as they slip too quickly away. The music was spellbinding and the play of light over the sea really was beautiful. I guess I just got caught up in the atmosphere and missed some dialogue somewhere or something." 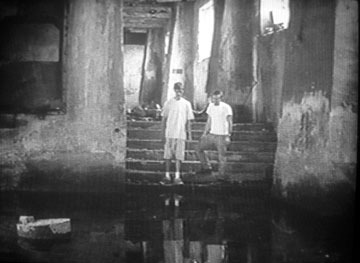 Festival organizers accepted the film as a late entry based on the strength of Smiths previous efforts: Mess Hall a powerful action-filled short that summons the passion of war in the service of a simple meal, and Fuzz a dry-witted rumination on the futility of law enforcement (which had been considered too edgy for previous festivals). Although they seemed a little taken aback by Avalon Beach, the organizers were quick to emphasize their support for experimental independent film-making, uncorrupted by commercial pressures. "It's up to us to see that these efforts find their audience. The big studios wouldn't touch something like this... something that challenges the viewer and refuses to provide easy answers or mindless escapist thrills." Smith himself, unable to attend due to commitments in Central Europe, remains an enigmatic figure in local cinema. His trademark low-tech visual style has earned him a reputation as hard realist. 'Avalon Beach', proves that he is just as comfortable with the surreal. Make that really, really surreal.